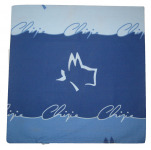 Since 1967, the Chipie brand offers numerous articles with its mascot: the Scottish terrier in a red scarf still in authentic style and vintage. Flat bed sheet 180X290 cm and 1 pillowcase 60x64 cm 100% cotton Chipie marshmallow pink. Unbleached flat bed sheet with Chipie dogs in pink, burgundy and anise green surrounded by pink flowers and circles. Ecru pillowcase with steering wheel and reversible. Washable 60°C. Flat bed sheet 240X300 cm and 2 pillowcase 60x64 cm 100% cotton Chipie marshmallow pink. Unbleached flat bed sheet with Chipie dogs in pink, burgundy and anise green surrounded by pink flowers and circles. 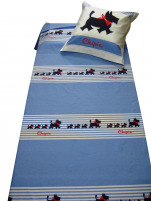 Ecru pillowcase with steering wheel and reversible. Washable 60°C. Fantasy washcloth burgundy pink Chipie 15x22 cm 100% towelling cotton with small multi-color batten: orange, pink, purple and fuschia.